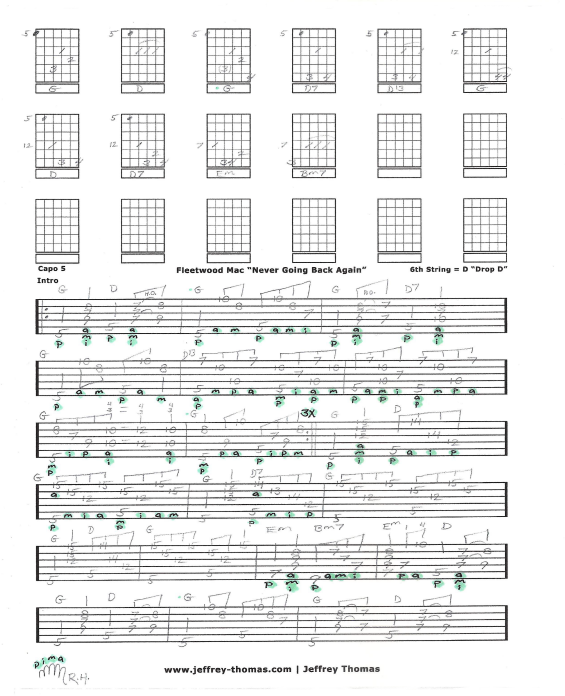 Fleetwood Mac Never Going Back Again Free Guitar Tab by Jeffrey Thomas. I have this guitar tab arrangement in Drop D with capo at 5 following the original recording. Learn the proper song structure, chords and fingerpicking details. This is a great folk, pop style fingerpicking song with a cool mellow vibe. I have many students who are into this style of guitar playing. I you would like the full guitar tab for this song just enter your email in the form and I will send it to you. If you would like more help learning this song let me know. Fill out the Schedule A Free Lesson form and we can set up a free Skype guitar lesson. “Never Going Back Again” was written by guitarist Lindsey Buckingham and released on the 1977 album Rumors. Find more great online guitar tabs on my tab, video and blog pages.